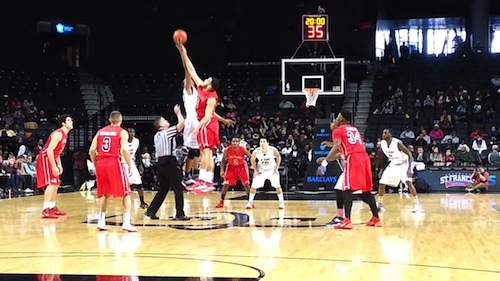 Men’s Basketball: Terriers drop “The Battle of Brooklyn” 69-68 in what proved to be another classic battle between the Terriers and Blackbirds. Final: Today’s matchup between the two bitter rivals was no difference from any other meeting between the two teams. From the opening tip there was that extra buzz in the arena that comes with a heated rivalry. The Terriers got off to a slow start in the first half, but were able to find their groove but were unable to bottle up the Blackbirds. They fought just like they did in every game, despite being down by 9 points on two seperate occasions they were able to come back and even grab a lead for a short period of time. “These guys got a lot of heart.” Coach Glenn Bracia on his teams will to fight from behind. The Terriers played like themselves after a horrible game last Saturday against first place Robert Morris. That effort had all to do with the suspensions of four players. They went into that matchup with a dismembered roster, which makes it difficult for any team to compete. Today marked the return of Junior guard Brent Jones and Freshman forward Wayne Martin. Both played big minutes and contributed from the second they stepped on the floor. Jones scored 13 points and dished out 4 assists on the afternoon. Martin finished with 6 points and 4 rebounds. Jones and Martin both mean a great deal to the Terriers so their return will prove to be pivotal down the stretch. Jones is the team’s floor general, without him there is a clear lack of offensive continuity. Martin has hit a number of big shots for the Terriers and is a great defender who presence would have been missed. Senior guard Ben Mockford led the way for the Terriers this afternoon, he scored 17 points on 6-13 shooting from the field and 3-7 from behind the arc. Junior forward Jalen Cannon finished the game with 15 points on 5-10 shooting. Cannon was only able to grab 6 rebounds on the day, as the Backbirds did a nice job boxing him out and controlling him on the glass. With 16 seconds remaining in the game the Terriers were down by 2 and had a chance of tying the game up. Wayne Martin had the ball at the top of the key and drove to the basket but failed to convert, as he was smothered by the Blackbirds defense. “He saw an opening, he took it that’s what good players do sometimes, you have to improvise.” Coach Glenn Bracia commenting on the pivotal possession for the Terriers. The Terriers fought but it proved to be too litte too late, as the Blackbirds where just too much for them to handle on this day. The Blackbirds were led by “The Battle of Brooklyn” MVP senior guard Jason Brickman, and Junior forward Landon Atterberry. Brickman only scored 3 points on 1-10 scoring, the Terriers did a great job limiting him from scoring, but they weren’t able to control him from finding his teammates as he dished out 14 assists. Landon Atterberry was the beneficiary of a handful of those assists. He came off the bench to score 20 points on 9-12 shooting, he proved to be too much for the Terriers as he was able to create from inside and out. Junior guard Gilbert Parga provided some good minutes off the bench, he scored 14 points. Junior guard Gerrell Martin also had a nice day scoring 13 points of his own on 5-8 shooting. Martin was perfect from behind the arc, knocking down all three of his three pointers. “The Battle of Brooklyn” proved to be exciting as always this year, today’s performance did not lack the dramatics as it came down right to the wire. Something to look for going forward is the status of Sheldon Hagigal who was not on the bench for the Terriers today. The Terriers are back in action on Tuesday February, 17th where they take on the CCSU Blue Devils at home. This will be a big game for the Terriers as they have dropped their last two games, they needed a win to get things back on the right track. Halftime: The Terriers are holding on to a narrow one point lead as they are up 34-33, against the LIU Brooklyn Blackbirds. After a slow start for the Terriers they were able to find their form in the first half of this one. They once trailed by as many as 9 points, but were able to cut the lead thanks to an 11-1 run. The Terriers got a huge boost off the bench this afternoon as two of the four suspended players made their returns. Junior guard Brent Jones and Freshman forward Wayne Martin have both came off the bench to play some big minutes in the first half. After a horrible performance last Saturday where the Terriers were blown out by Robert Morris, they have been able to get it together this afternoon. Senior guard Ben Mockford has led the way with 10 points on 3-7 shooting. Junior forward Jalen Cannon has scored 9 points on 2-5 shooting, he is 5-8 from the free throw line. The Blackbirds have been led by Junior forward Landon Atterberry, who has a team high 10 points on a perfect 4-4 shooting. Blackbirds Senior guard Jason Brickman has been quite, he has only scored 3 points on 1-6 shooting. He has been able to get his teammates involved as he has dished out 7 assists. The Terriers must carry over their solid play into the second half. They can not afford to come out flat, because the Blackbirds will jump all over it. They must continue to control Jason Brickman, who can cause havoc by breaking down the defense. If the Terriers can put it all together in the second half they should walk out of this affair as “The Battle of Brooklyn” champs. Something to keep an eye on is that Freshman guard Sheldon Hagigal is not on the bench for the Terriers this afternoon.